Peter Boniface Gritting Services’ Operations Manager (right). 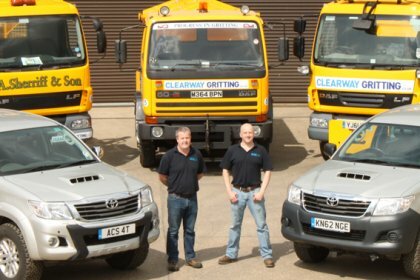 Clearway Gritting are proud to announce the arrival of Peter Boniface, taking up the role of our new Gritting Services’ Operations Manager as we continue to expand. Peter used to work on the haulage side of the business between 2000 and 2007, before leaving to join the Police service, where after 6 years, having attained rank of Detective Constable, Peter left to take up this new role with Clearway Gritting. Despite having thoroughly enjoyed his time in the service, Peter felt the time was right to embark on this new and challenging role.